Children's Healthcare of Atlanta is reminding families to be safe this July 4th and avoid directly handling fire-related devices like fireworks and sparklers. During this time of celebration, Children's urges everyone to leave fireworks to the professionals. "The Fourth of July is an occasion to celebrate outdoors and spend time with family, but nothing ruins a party like a trip to the emergency room," says James Fortenberry, M.D., Director of Critical Care Medicine and Pediatrician-in-Chief at Children's Healthcare of Atlanta. "With the long list of local professional firework displays available, there's no reason to risk life-threatening injuries and burns by putting on your own show. Leave the fireworks to trained professionals." According to the National Fire Protection Association, during the weeks surrounding July 4th an average of 200 people visit an emergency room with fireworks-related injuries. 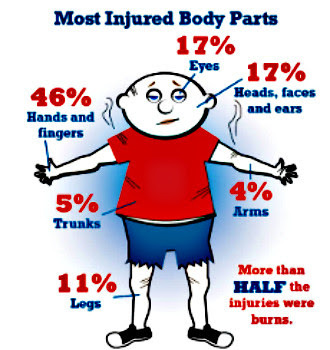 Fifty-seven percent of all fireworks-related injuries occur during this time each year. The risk of fireworks injury is highest for children ages five to 14, with more than twice the risk for the general population. Children under 15 years old account for 39 percent of the estimated fireworks injuries, which can include burns, contusions/lacerations, concussion, scarring and even death, according to the Consumer Product Safety Commission. A list of some Atlanta-area public firework shows can be found here. For more tips on summer safety from Children's, please visit www.choa.org/summersafety.